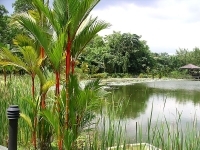 Singapore's Botanical Gardens sweep across an area of 52 hectares (128 acres) constituted by primary forest and specialty gardens in close proximity to the city centre. The National Orchid Garden is the world's largest orchid garden, featuring more than 20,000 varieties set among water features and an exotic bromeliad collection from South and Central America. The park also contains many rare plant specimens in addition to the specialty gardens decorated with frangipanis, roses, ferns and desert plants. Outdoor concerts in the gardens can be enjoyed on the Symphony Lake or French cuisine can be savoured at the Au Jardin restaurant. Because the gates open so early the gardens are the perfect place for some morning exercise in Singapore and in the morning the grounds are full of dog-walkers, runners and yoga and tai-chi practitioners, creating a stimulating, active environment. The Jacob Ballas Children's Garden is located at the quieter northern end of the gardens and has its own visitor centre and cafe - here those travelling with kids will find a playground, some tree-houses and a maze, as well as some educational, interactive exhibits. The gardens are consistently one of the most popular attractions in Singapore, loved by both locals and tourists.